Early last December Ontario’s Liberal government released their latest “Long-Term Energy Plan” (LTEP). The document indicated Ontario currently has sufficient capacity to meet “North American reliability standards,” unlike a decade earlier when the Liberals came to power in Ontario. In 2004, Ontario’s supply outlook was not sufficient to meet North American reliability standards. Today’s margins are above required levels. This reflects the strong supply of electricity the province is enjoying. Ontario has gone from a deficit of 3,800 MW in 2003 to a comfortable surplus in 2013. 4 years is a very short time for developing reliable supply. 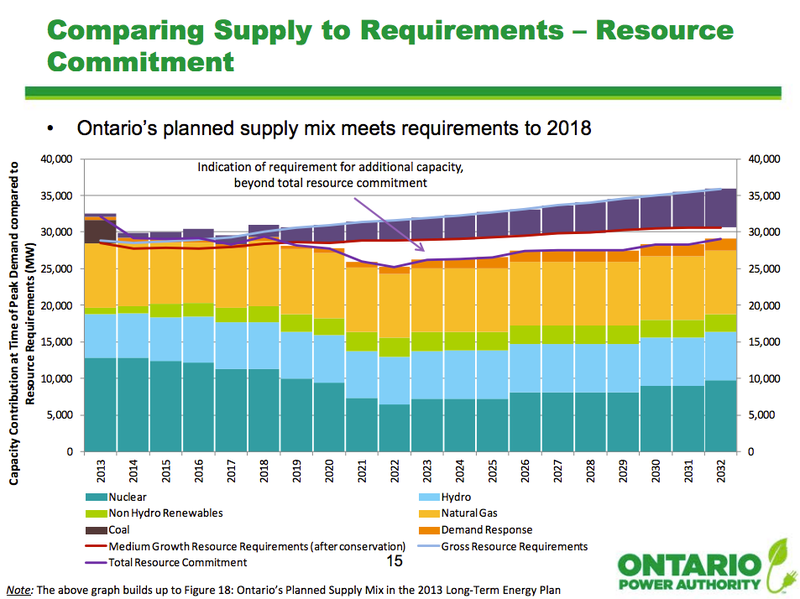 The firm supply Ontario added from 2003-2005 is different than the capacity additions planned for the next few years, which is primarily from variable intermittent energy sources (vRES); wind and solar. OPA Slide from "Generation and Conservation Tabulations..."
The numbers shown by NERC won’t surprise the Ontario Power Authority (OPA), or Ontario’s system operator (the IESO). The OPA’s material demonstrating the figures behind Ontario’s LTEP also shows the capacity shortfall starting in 2019 and building to over 3,600 MW in 2022. The plan is for Ontario to be in the same supply position a decade ahead of now as it was a decade behind. NERC’s forecast shows that, in two out of 3 models, Ontario is planned to have the lowest reserve margins in North America. NERC’s models do offer Ontario a glimmer of hope in the “adjusted potential” scenario, which accounts for “the inclusion of less-certain resources, such as Conceptual capacity and nonfirm capacity transactions.” Problematically, NERC failed to anticipate the wide capacity scares of the past, “polar vortex”, winter. The trend for the near future is likely to treat “conceptual capacity and nonfirm capacity transactions” with a great deal of skepticism. From my recent "LTEP 2013: An unfinished plan"
The plan also expected a great deal from existing nuclear power stations. The LTEP’s commitment to nuclear is lukewarm, and possibly impractical. Ontario plans to refurbish units at the Darlington and Bruce Generating Stations. The refurbishment has the potential to renew 8,500 MW over 16 years. The province will proceed with caution to ensure both flexibility and ongoing value for Ontario ratepayers. Darlington and Bruce plan to begin refurbishing one unit each in 2016. Final commitments on subsequent refurbishments will take into account the performance of the initial refurbishments with respect to budget and schedule by establishing appropriate off-ramps. That sounds reasonable, but the LTEP’s refurbishment schedule may stack the deck against reliable nuclear operations; it shows Bruce B’s reactors operating for about 40 years prior to refurbishment. One expert analysis notes these units were predicted to need refurbishment due to components with a life of, “210,000 Equivalent Full Power Hours (EFPH) or 30 years at an 80 percent capacity factor.” Units at Bruce B will approach 300,000 EFPH if both the LTEP’s refurbishment schedule and its anticipated generation from nuclear power plants are met. The Wynne government’s long-term energy plan promises only tepid commitments to maintaining the firm generation it currently possesses, and results in the continent’s worst forecast for meeting reserve requirements in the coming years despite projecting demand growth to be among the slowest on the continent. 1. most of this capacity was nuclear; Bruce units 3 (2004) and 4 (2003), and Pickering units 4 (2003) and 1 (2005). Bright Beach (natural gas) also entered service in 2004.